You may have read a commentary I wrote where I express fully how I felt about someone like Jay-Z dissing an icon such as Harry Belafonte. If you didn't get a chance to read it please feel free to read it now by clicking here. The back and forth began when Harry Belafonte, being the elder statesman that he is, took it upon himself to speak of his disappointment in today's artist when it comes to social responsibility. Two of the people he called out specifically were Jay-Z and Beyonce. Beyonce responded to the criticism by having her people put out a list of charities she was involved. Jay-Z, on the other hand, chose to remain silent. Well that was until a track titled Nickel and Dimes emerged on his latest album. Trust me, I wasn't the only one criticising Jay-Z's blatant disrespect of Mr. Belafonte. Obviously there was enough criticism that Jay-Z felt the need to explain the lyric. I think Jay-Z was off in thinking that his presence alone is charity. He is not the first of his kind to achieve in business and entertainment. Whereas Barack Obama is the first of his kind to become President of the United States. Harry Belafonte, like many of his generation, do not think that the younger generations carry the mantle as they should. I do not know all that Jay-Z encounters in all of his dealings to say that he is not positively impacting the quest for equality and justice. Many think that our respected elders have earned the right to say whatever that what to say. I disagree with that premise. Mr. Belafonte can say that he was disappointed. Ok. I just don't understand why have certain expectations of other people. We are free to take on what ever we choose. Some artists are more vocal; some are not. Some artists give more money; some do not. Some choose to not get involved in any way. That is their choice. Social justice does not rise and fall with Jay-Z, Beyoncé or any one person. In terms of the present discourse, I would like to see the two men meet and have a discussion. I don't know of Harry Belafonte ever reached out to Jay-Z. If he hadn't, it would've been nice if he had. 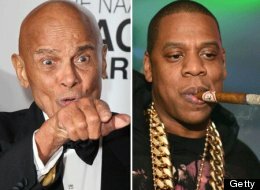 Jay-Z could also reach out to Mr. Belafonte. I think of how Jamie Foxx has said on numerous occasions of how Sidney Poitier reached out to him and really impressed upon him the notion of being more responsible with his artistry and his influence. Jamie was changed indelibly by that. The same could be true of Harry Belafonte and Jay-Z. Hopefully they have not reached the point of no return. People have expectations of people because "he who much is given, much is expected." Simple and to the point. The person can make a choice not to leave up to those expectations, but it doesn't make the expectation go away. Sigh. He don't get it. Now that Jay Z and Beyonce "Get it" and made personal apperances for a cause...Who is next?